Sleep is a precious commodity. Get enough of it and you feel ready to take on the world. Get shorted, and you might feel tired, irritable and even somewhat under the weather—after all, sleep is important to maintaining a strong immune system. The problem is some people aren’t getting enough sleep and they don’t even know it. 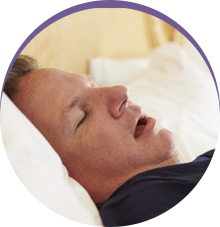 Sleep apnea is a chronic condition that causes breathing to stop for a few seconds or up to a minute during sleep. And while you might not remember these awakenings, your brain does. With obstructive sleep apnea, tissue in your throat relaxes enough during sleep that your airway becomes partially blocked. To restart normal breathing, your brain awakens the body. The cumulative effect of these multiple awakenings can add up to hours of lost sleep. Traditionally, sleep apnea was treated with a CPAP—continuous positive airway pressure—machine. The forced air from a CPAP machine that is delivered through a face mask keeps the airway open. Unfortunately, this machine is often intolerable for some people who find the mask uncomfortable or are bothered by the side effects of forced air: dry mouth and throat, dry skin, and nasal troubles. 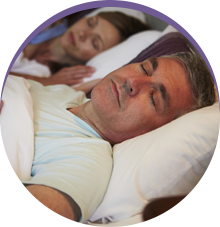 Dr. Fedosky and his team at Sleep Rehab offer viable CPAP alternatives.With a custom fitted oral appliance, we can often achieve the same results as a CPAP machine, but without the bothersome side effects. We use the Narval by ResMed. This mandibular repositioning device (MRD) is precisely designed with CAD/CAM software. Worn nightly while you sleep, the ResMed MRD repositions your lower jaw and tongue forward in order to keep your airway open. You’ll be able to sleep peacefully and get the rest you need each night in order to have a good day and a healthy life! To learn more about CPAP alternatives in Plano, contact Sleep Rehab. 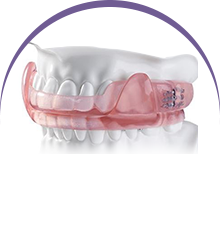 We’ll be glad to consult with you and show you how an oral appliance might be the solution to your sleep apnea.